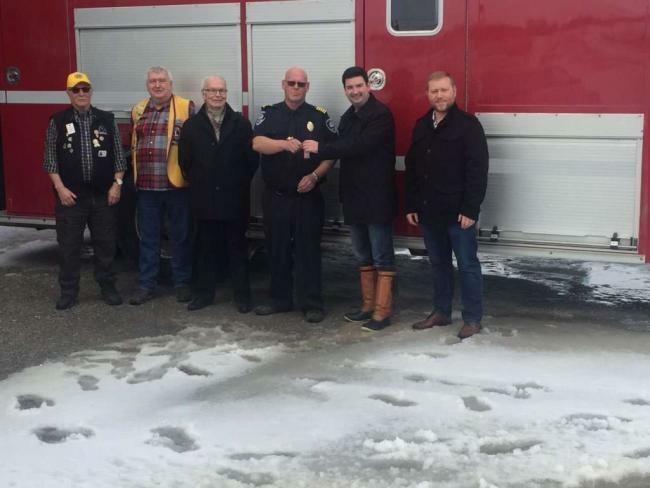 L-R Cyril Simmonds and Geoff Christenssen (St. Anthony Lions Club) , IGA Director Edward Goudie, Fire Chief Peter Green, MHA Christopher Mitchelmore, and Mayor Desmond McDonald. This past year, the IGA granted $25,000 towards a new rescue unit at the St. Anthony Fire Department. It was a contribution that assisted the Department in making its 10% share of the cost of the unit (estimated at $250,000), with the remaining 90% being funded by the provincial government and the town. This new rescue unit is set to replace an older truck that can no longer legally handle existing equipment in a safe manner while travelling on local roads, due to weight restrictions. On Friday, March 16, 2018, there was a grand unveil and passing over of the keys for the unit, held at the St. Anthony Fire Department’s facilities. The IGA was very pleased to have its local Director from St. Anthony, Edward Goudie, take part in this event. It was a great lead up to the 50th anniversary of the Department in 2019! Congratulations to all those involved in making this new unit a reality! The IGA entertains grant applications every year from fire departments in its service area, as they continue to provide essential services!